Spatial Regression Models for the Social Sciences by Guangqing Chi and Jun Zhu (SAGE, 2019). This is a primer type of textbook for social scientists who would like a quick start to learning spatial regression methods. The past few decades have seen rapid development in spatial regression methods, which have been introduced in a great number of books and journal articles. However, when teaching spatial regression models and methods, the authors had difficulty recommending a suitable textbook for students in the social sciences to read. Many of the existing textbooks are either too technical for social scientists or are limited in scope, partly due to the rapid development in the methods. A textbook that provides relatively comprehensive coverage of spatial regression methods for social scientists and introduces the methods in an easy-to-follow approach is much needed. This book fills the gap and focuses on the methods that are commonly used by social scientists and tend to be useful to them. These methods include exploratory spatial data analysis, methods dealing with spatial dependence and/or spatial heterogeneity, and spatio-temporal regression models. The distinguishing features of the book include: comprehensive coverage of spatial regression models—from simple concepts and methods to advanced models—makes this book useful for a diverse audience including instructors, researchers, and students in a wide range of disciplines; the book’s pedagogy includes study objectives, sidebars highlighting important points, figures/illustrations, and study questions for easy mastery of the material; supplemental materials including figures in color, data, and codes are available on github.com/srmss, which also hosts online discussions and new materials. This book could be particularly useful for social scientists who are familiar with standard regression methods and desire to learn spatial regression models and methods. The Population Research Interest Group (RIG) of the Rural Sociological Society is soliciting submissions for a graduate student paper award in the areas of rural demography and population studies. The RIG takes a broad view on acceptable topics as long a rural population characteristics factor prominently in the research. Eligibility: Current graduate students and recent graduates (who receive their degrees no earlier than May 2019) may apply. Coauthored papers are acceptable as long as all of the authors were students at the time the paper was written and submitted. Coauthored papers with individuals possessing their terminal degree prior to May 2019 will not be considered. Award: The recipient will receive a monetary prize of at least $200 (final budget TBD) to help defray the cost of attending the 2019 RSS Annual Meeting in Richmond, VA (Aug. 7-10 2019). The recipient will also be recognized at the Population RIG business meeting. 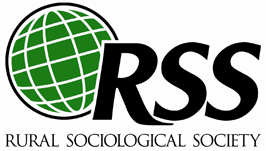 Submission Guidelines: Follow two steps: 1) Submit an abstract to present the paper at the annual meeting of the Rural Sociological Society (due Friday, February 15, 2019, 11:59 pm EST). 2) Send an electronic copy of the full paper with contact information to the RIG co-chair Scott Sanders ([email protected]) by Friday, May 4, 2019, 11:59 p.m. EST. Format: The paper submission should not exceed 35 double-spaced pages (including all tables, graphs, and references) in a standard font (12 point). The winner will be selected by a committee of RIG members and receive their award at the RSS Annual Meeting. The winner will be notified via email by June 1, 2019. The Community, Family, and Health Research Interest Group (RIG) is proud to announce the sixth annual Ronald Wimberley student paper competition designed to encourage and support graduate student research on rural communities. The call for papers is open to a wide range of topics in keeping with the spirit of the award’s namesake, Ronald Wimberley. Emphasis should be placed on the improvement of the quality-of-life in rural communities. Preference will be given to those papers that make a strong contribution to our understanding of rural community life and health. How are rural communities adapting to challenges brought about by scientific changes, economic transformation, or health needs? Papers submitted for this competition will be held to a high standard with respect to the level of scholarship. The length of the paper should range from 20-30 pages and should include a relevant review of the literature, original analysis, a clear discussion and set of conclusions, complete references, and be written at a professional level. The Community, Family, and Health Research Interest Group (RIG) is proud to announce the fourth annual Ralph B. Brown scholar paper competition designed to encourage and support research in rural communities. The call for papers is open to a wide range of topics in keeping with the spirit of the award’s namesake, Ralph Brown. Emphasis should be placed on such topics as community satisfaction and attachment, social change and development, family and community, and community leadership. International research is highly encouraged in accordance with his dedication to international development studies. Preference will be given to those papers that make a strong contribution to our understanding of rural community life and health. How are rural communities adapting to challenges brought about by scientific changes, economic transformation, or health needs? Who is eligible: The Ralph B. Brown Scholar Paper Competition is open to faculty and non- academic researchers who have an advanced degree. Graduate students are not eligible but are encouraged to submit a paper to the Ronald Wimberley student paper competition. Papers submitted for the scholar paper competition will be held to a high standard with respect to the level of scholarship. The length of the paper should range from 25-35 pages and should include a relevant review of the literature, original analysis or effort to advance community theory, a clear discussion and set of conclusions, and complete references.